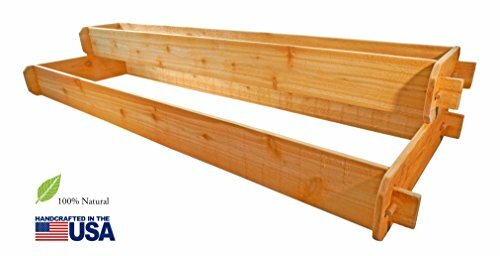 Raised garden bed kit dimensions: 1 foot wide x 6 feet long (6 inches deep) and 2 feet wide x 6 feet long (6 inches deep). Deepest depth is 12 inches when stacked. 5/8" thick. Constructed of sustainably managed Western Red Cedar (Rough Sawn). 100% natural and chemical free. Mortise and Tenon joinery. Simple, no tool and splinter free assembly. Easy to transport. A beautiful, double tiered gardening bed. Use as two separate beds or stack them as one double tier bed. Joining brackets included. Deep beds allow more planting in a smaller space, such as Square Foot Gardening.